Jeff Patton, a.k.a Father of Agile-UX, is doing the most innovative work around product discovery, release planning, agile interaction design, and putting requirements into context. 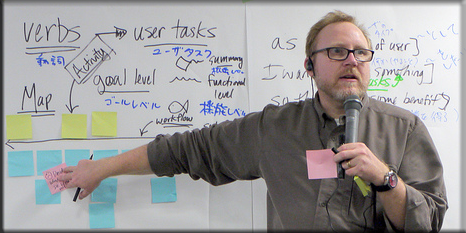 Jeff won the Gordon Pask Award in the year 2007, for his work helping establish what User-Centered Design means in Agile. Jeff brings two decades of experience from a wide variety of products from on-line aircraft parts ordering to electronic medical records to help organizations improve the way they work. Where many development processes focus on delivery speed and efficiency, Jeff balances those concerns with the need for building products that deliver exceptional value and marketplace success. We are thrilled to offer Jeff’s exceptional Passionate ProductOwner (CSPO) workshop at the Agile India 2013 Conference. Why the passion in product ownership? First off, “Passionate Product Ownership” is a stupid title, because you can’t teach someone passion! However, I’ve always been involved in Product Development and Product Management, and I take the greatest pride from knowing that I’ve made a product or put something out into the world that other people use. The class focuses on understanding the business problems we are solving – the people who will use the product and understanding what their problems are. While I can’t teach passion, we can certainly focus on helping everyone understand that they are building products that help people, and that’s where the passion comes from. The product ownership role is often defined as one of the most challenging roles defined in scrum, why is this? Scrum and Agile processes in general, offer a lot of tactical guidance for how to get software built. But most Agile processes depends on getting the right person in the Product Ownership role – someone who already knows what to build. This role difficult because you are responsible for building the right thing, and you are also responsible for communicating what that right thing is to a large group of people, sometimes in excruciating detail! In this class, one of the first things you’ll learn is that while there may be a single Product Owner who acts as a leader, product ownership is handled by a team of people. I’d rather that the role of Product Owner was named “Product Leader” and that whole teams take ownership. If you survive the class and adopt this way of thinking, you’ll be practicing a type of product ownership where everyone is involved in figuring out the details of what to do, who the user is, how best to help them and what solutions should be built and described in detail. You’ve done significant work in blending UX & Agile. Where do you think the community is headed as far as UX on Agile projects go? That’s a great question! It depends on which community you’re talking about. In the early 2000s, I spent a lot of time in the Agile community trying to help them understand what user experience was and its importance. Simultaneously, I spent time with User Experience people trying to help them not be so darn afraid of Agile Development as if it was going to “wreck” things. I’ve seen a lot of maturation over the last decade and many UX people now have experience working inside Agile projects and teams. The coolest thing that’s happened within the User Experience community is that they have learned to change their practice so it works better in an Agile context. I’ve also seen more and more organizations working with Agile development recognizing the importance of understanding users and building products that people like. Organizations see that UX is the kind of work that happens outside the code and it isn’t an “engineering thing.” Currently, I am seeing the User Experience community going deeper and evolving practices that work better. For example, you’ll find books on Agile User Experience and Lean User Experience. Also more and more people who teach Agile practices acknowledge, or at least understand, what a user experience person does, although some challenges remain. A new kind of Agile is forming, where the work that UX people do to understand users, prototype and try out ideas, is now called Lean Start-Up. A friend of mine, Leah Buley, once said, “Design isn’t a product that designers produce. Design is a process that designers facilitate.” The communities are starting to understand that the user experience work is cross-cutting and the concern is threading it’s way into everyone’s process. You will learn the practices that support the “Product Discovery” process and how to do discovery well. Building the right product is about understanding who the product is for and how they are going to benefit from using it. This is not a singular person’s responsibility – it is the whole team’s responsibility. The practices you’ll get in the class that support this come from user experience. Practices such as simple personas and story mapping provide understanding of users and model user behaviors. You’ll also get practices for good project management. For example, focusing product releases on specific target users, tactically guiding releases, ways to slice stories thinly to slowly build up a product, so that as soon as possible, it is a shippable, complete product. You’ll also gain practices for building small amounts of product as experiments to really validate if you are building the right product.